Wallace hatched on April 20 to parents, Liberty and Mariano, light blue banded pair. This is the pair’s first chick successfully raised together. Prior to this chick, the pair had three other chicks. Two reside at other zoos, but Anchovy, banded pink on her left-wing, still lives here at the Zoo! Just over two-months-old, Wallace already weighs 6.5 pounds. Adult Humboldt penguins weigh 7 to 13 pounds, which means Wallace is almost full-grown! 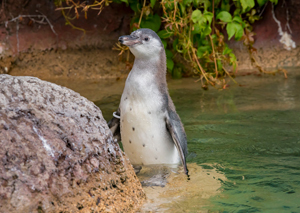 He was named after Dr. Roberta Wallace as a tribute to her contributions and work with penguins in the wild. Dr. Wallace was the senior staff veterinarian at the Zoo and is a big advocate for penguins in human care and in the wild. In the wild, Humboldt penguins are found in the open ocean, rocky shores or islands off the coasts of Chile and Peru. These penguins are social creatures that live in small colonies known as rookeries. Unfortunately, the population is facing a decline due to over-fishing of their food source (anchovies, krill and sardines), entanglement in fishing nets and periodic El Niño weather patterns. Humboldt penguins are covered in black and white feathers, with a distinctive u-shaped black band around their eyes. The black and white coloring is a form of camouflage crucial in avoiding predators and catching prey. The dark color on their back helps with blending into the ocean, while the lighter color on their front helps with blending into the brighter ocean surface. Besides the monochrome feathers, these birds have splotchy pink patches on their feet and bill, which is slightly larger than other penguins. Wallace, still a juvenile, has dark grey feathers with a light grey belly. Once he reaches 1 year old he will molt, and then his adult markings and coloration will fill-in. Visit the Humboldt penguins and see if you can spot Liberty, Mariano, Anchovy and Wallace (banded white on his left-wing)!